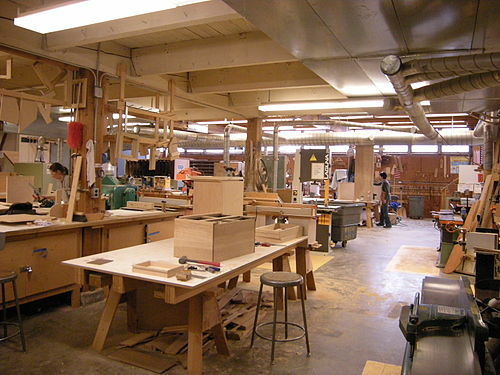 Woodshops like this one at Seattle's Central Community College are quickly disappearing. Photo by Joe Mabel. Permission granted by photographer. Shop classes have all but disappeared from many American schools, and at first glance that might seem like a logical step. Why would today's wired kids need to know how to work with their hands? The answer is that they still need the inspiration and understanding that results from turning something digital into something real. As the Wall Street Journal recently reported, manufacturing jobs paying upwards of $80,000 a year are going unfilled in an era when unemployment hovers around nine percent. Three factors are contributing to the shortfall in workers. Baby boomers with sophisticated machine skills are retiring in large numbers at the same time that parents and guidance counselors discourage kids from pursuing careers in manufacturing. Additionally, the U.S. education system isn't producing enough graduates with the math and science proficiency necessary to operate and repair computer-controlled factory equipment. Given the limits of a one-size-fits-all education, it's hard to imagine how kids with the talent or inclination to qualify for skilled, secure jobs in the trades will even recognize it. The way to discover that you love woodworking is to build a piece of furniture; the way to determine you have the talent to be modern-day machinist is to operate a milling machine and create a mechanical part. And today's factory workers aren't just button-pushers; they need the math skills necessary to make intricate calculations daily. As for wired kids preparing for wired jobs in a wired world, even the most sophisticated design software can't substitute for an appreciation of how materials truly behave in a finished product. The choices an engineer or designer makes while creating a new product are often determined by what happens during the fabrication process. But what if no one ever taught you how to make anything? Parents are aware that arts and music are evaporating from schools, and they are doing what they can to replace those experiences through extracurricular activities -- in part because they understand their greater value. The ability to read music can enhance math comprehension. Art exercises the vital right side of the brain. And shop class is no different. Parents should consider investing in after-school activities that teach kids how to make furniture, jewelry, clothes and robots when they're signing up for soccer camp and gymnastics classes. Here is something even more radical: take them to a Maker Faire in addition to a professional sporting event. There are different ways to engage students, and making an object from start to finish is a proven method of making the concepts they learn in school relevant to life. Have we become so focused on cost-cutting that we forgot project-based learning is highly effective? The workforce is composed of all kinds of learners performing all kinds of tasks; the one room in any school building that can captivate all of them just might be the one with the lathe. It's not too late to unlock the door and dust off the equipment.